It's about time. Literally. It's about declaring projected finish times for the thousands of Boston Marathon runners who were not allowed to finish after the terrible tragedy suspended the race. 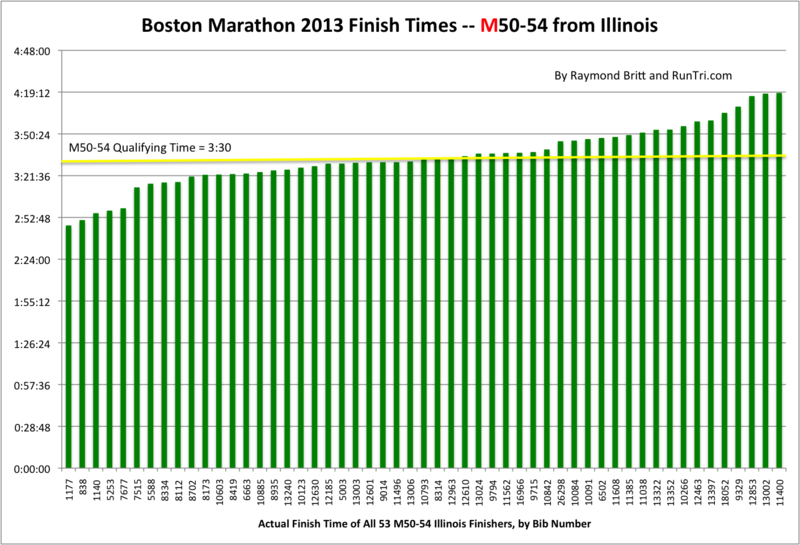 Three weeks have passed since the tragedy, and yet there is no resolution for those thousands who have every right to declare themselves Boston Finishers, given the circumstances of the day. Time for closure. 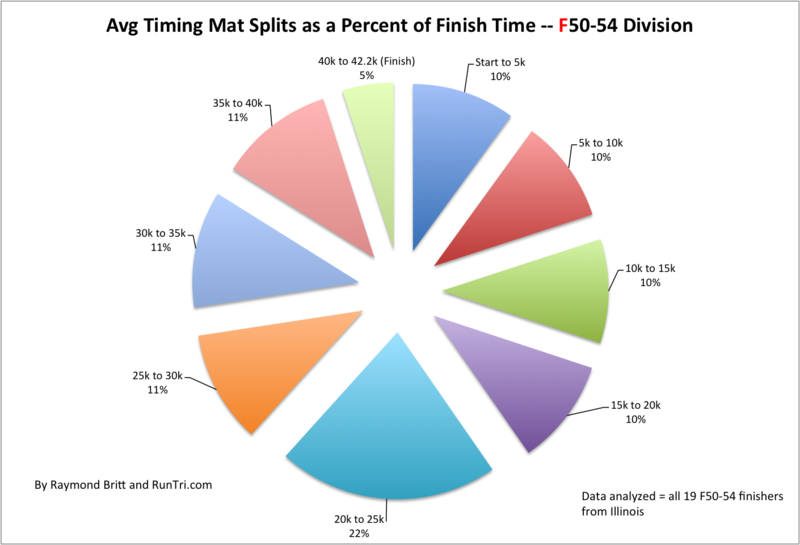 Time to define your projected finish time. The BAA's resolution isn't ready yet, which is reasonable, given the myriad of other issues they face. 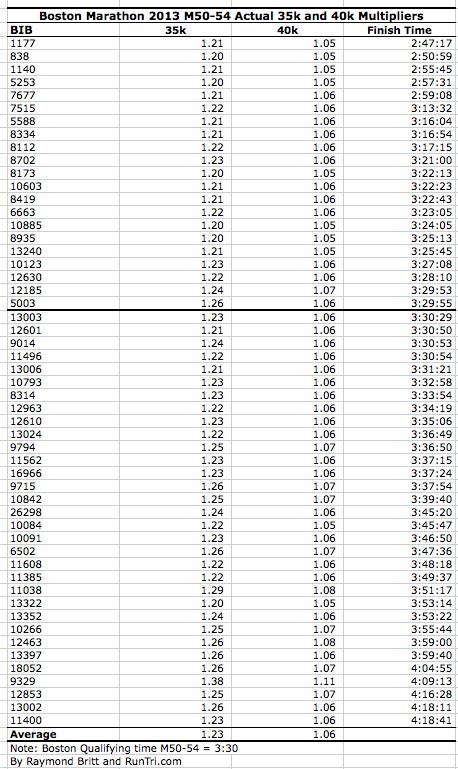 Until then, it's time to step up with projected finish times, and we've taken on the assignment (unofficially). 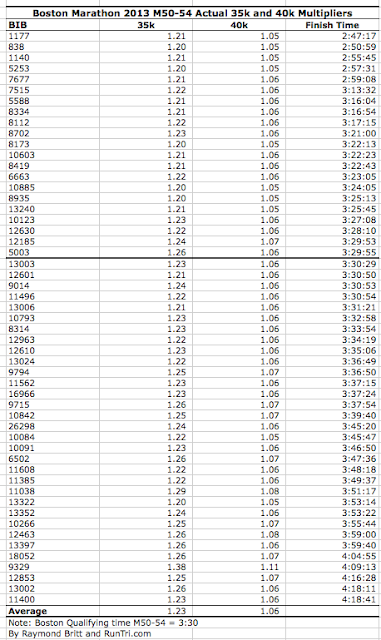 We ran the numbers, slicing and dicing the data every which way (see notes on Methodology, below), and after hours and hours of detailed analysis, I'll get to the punchline. Is this 100% accurate? No. 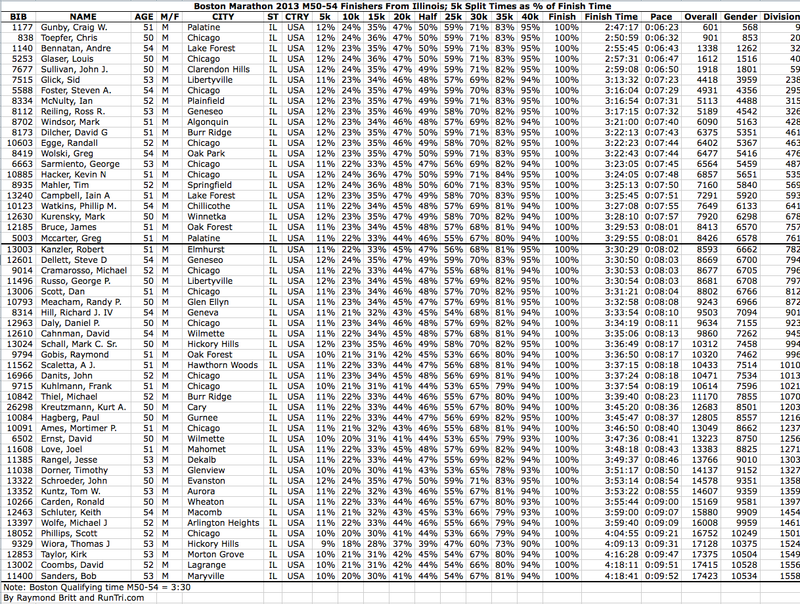 But I'd expect our projected results will be within a minute or two in a wide majority of the cases. 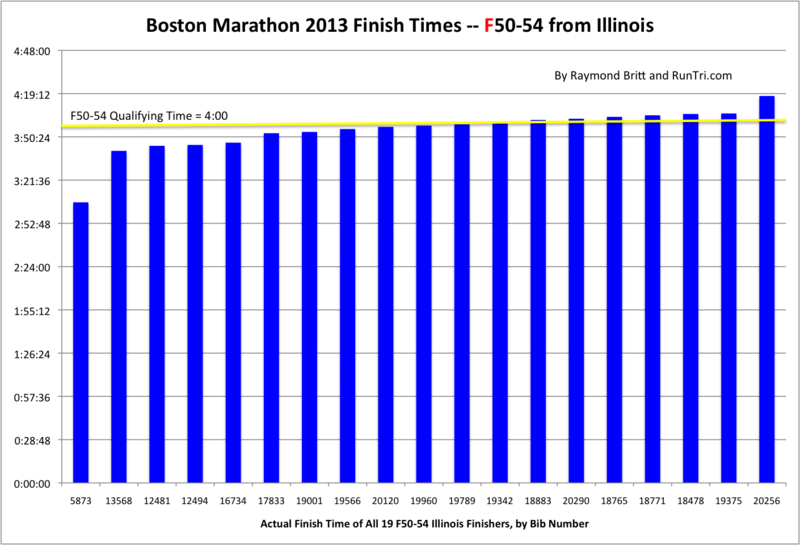 But: One exception will be the runners who went out too fast, too early, and had hit the wall, slowing to a crawl. 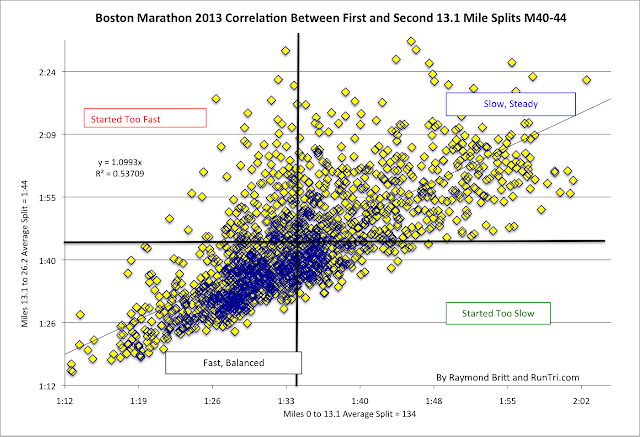 See our Correlation Between First and Second Half Split Times to gauge if you fit in that group. Will the BAA's resolution be different? It very well could be. We don't know what direction they will go. 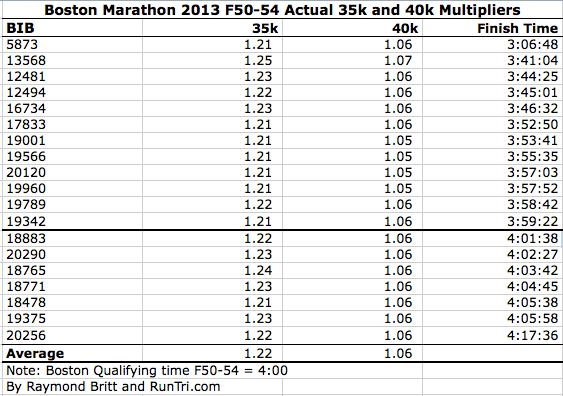 But one thing is clear: our analysis here is unofficial; BAA's will be the official resolution. We noted the multipliers above were 'deceptively simple' because it took a great deal of work to confidently calculate the appropriate value. Our approach is illustrated in an example of our analysis of all Illinois finishers in the 50-54 age group. This included 53 men, 19 women. 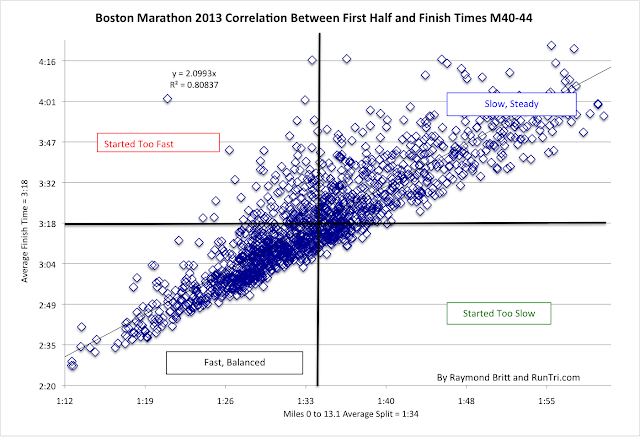 We did extensive analysis of this sampling of runners, tabulating their 5k splits from start to finish, comparing an contrasting splits from sub-3 hour finishers to 4+ hour runners, from Boston re-qualifiers to those who, well, didn't come close to requalifying. 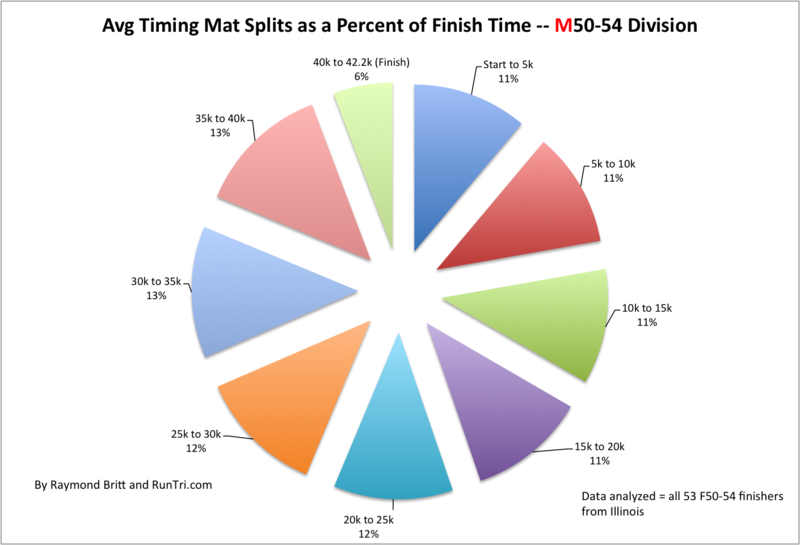 See data below, from drill-down detail for each finisher, up to average splits as a percent of total, which we used to calculate the 35k and 40k multipliers.